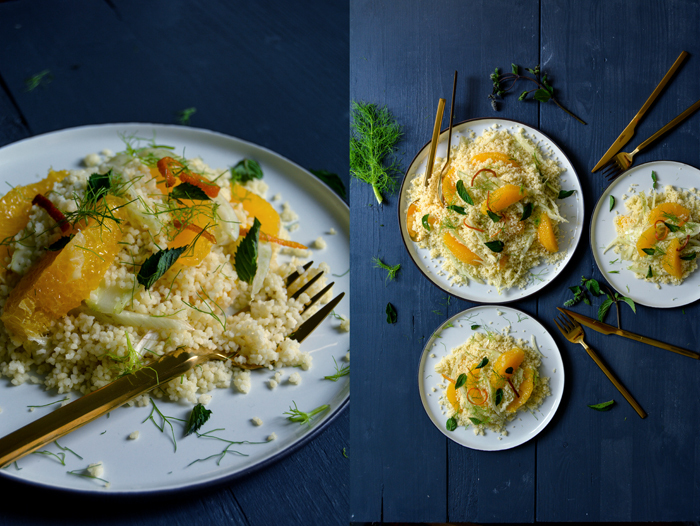 I decided to make couscous and cooked enough to feed a family of six – it shows that I don’t work with this grain very often. The package looked tiny but the result was humongous! It didn’t do the pleasure any harm though, the recipe was delish, we just had enough couscous for days. 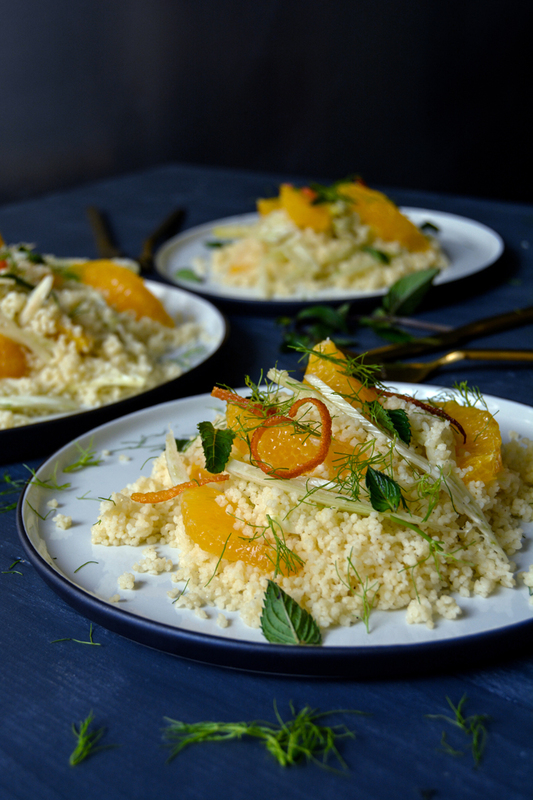 Inspired by a phone call with my mother and our obligatory recipe exchanges, I mixed the earthy North African dish with crunchy fennel sliced like carpaccio and juicy orange fillets. To focus on the citrus a little more, I roasted orange peel in olive oil in the oven to create a fragrant oil and some crunchy citrus bites. An open bottle of orange blossom water in my fridge convinced me to go for an orange trilogy – a good choice. Each of them added their individual depth, texture and aroma: the juices of the fruit paired beautifully with the crisp peel and the flowery scented water. Fresh mint leaves on top to finish it off and three happy people at the table ate far more couscous than we ever have before. 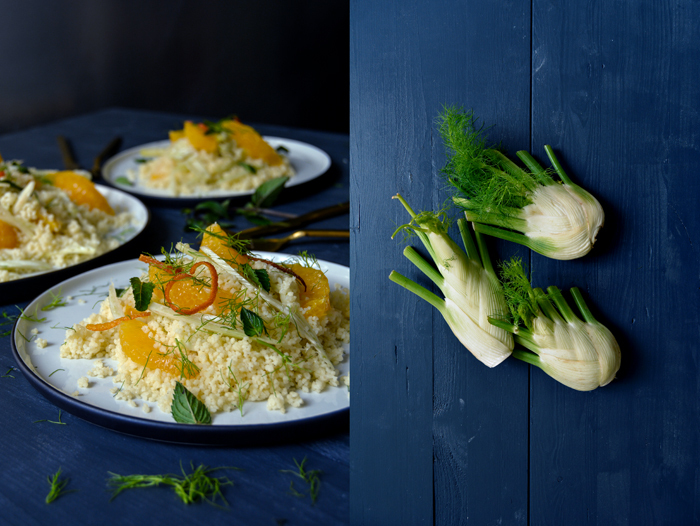 A short note: the amount of couscous in the recipe below is adjusted for 4. Pour 3 tablespoons of olive oil into a shallow baking dish, add the peel and cook in the oven for about 6 minutes until golden brown and crunchy, mind that the peel doesn’t turn too dark. Take out of the oven and set aside. To cut the orange into fillets, first peel off the outer skin with a knife and then cut off the white pith. Hold the orange in one hand and cut with the knife along the skin between the fruit’s fillets to end up with skin-free fillets. Collect the juices. For the couscous, put the grains in a large pot. In a kettle, bring double the amount of water to the boil (or adjust to the instructions on the package), pour the boiling water over the grains in the pot and close with a lid, let it sit for 5 minutes. 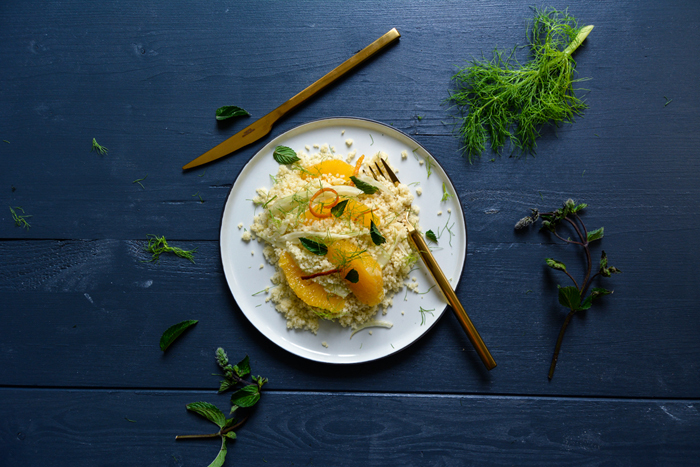 It’s not necessary to cook the couscous on heat. 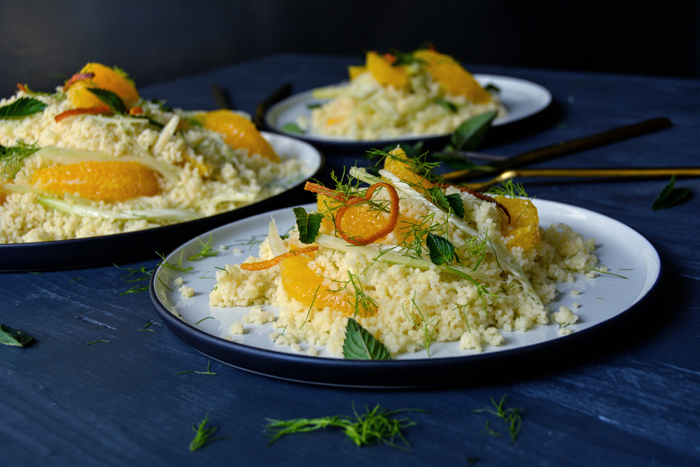 Transfer the cooked couscous to a large, deep bowl and gently stir in the fennel, orange oil, orange fillets and about 3 tablespoons of the collected juices (to taste). Season with orange blossom water (about 1-3 teaspoons, depending on the brand), salt and pepper to taste. 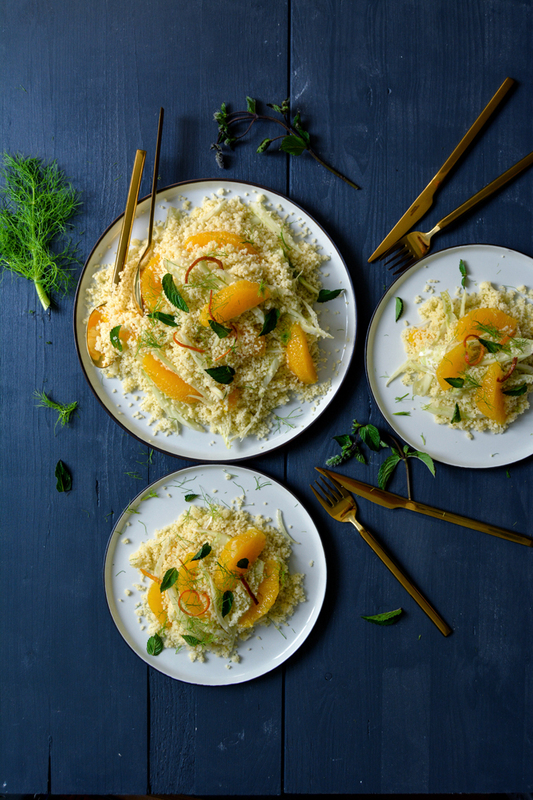 Add a little more olive oil if necessary and sprinkle with the roasted orange peel (broken into pieces), fresh mint and the chopped fennel green. Serve warm or as a cold salad. I would be willing to bet this would be great with some form of nut/seed added. Maybe sunflower seeds or pine nuts. That sounds good, I’ll give it a try next time I make this couscous! Have a nice Sunday! Meike this looks like the perfect thing to bring to my next family gathering!! I’ve never thought to roast orange peels but will need to try it!! Hi Gabriel, thank you!! 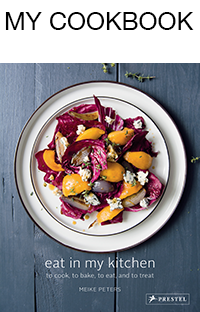 You should try it, the roasted peel combines crispy bites with the rich depth of orange – I love it! 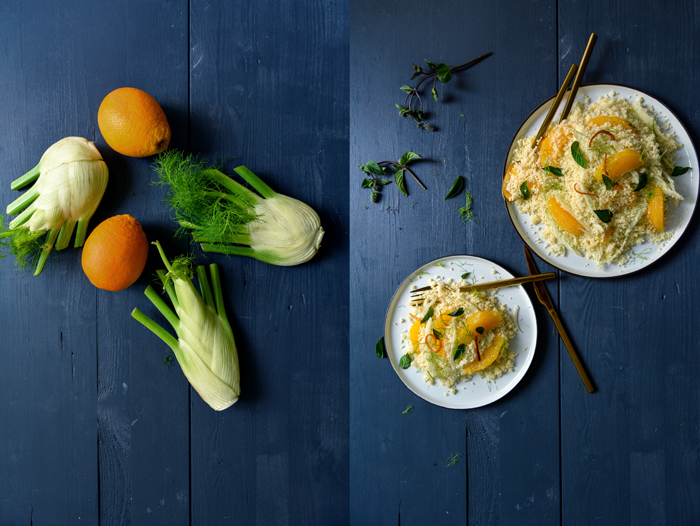 Quite refreshing dish for a great brunch!